Special Delivery: The messenger god has arrived! Read on to learn about Hermes and other changes in this update! 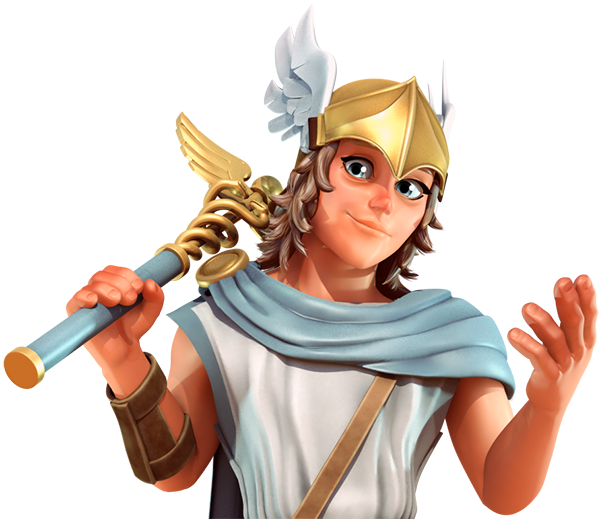 Hermes is best used at range, with a maximum health of 70,229 at level 70. Hermes uses his caduceus as a ranged weapon, with a maximum strength of 3189 at level 70. He has the fastest attack speed of the ranged gods. Hermes moves faster than most gods, with a speed of 21. Rapidly attack all enemies in a target area. Hermes is invincible during this attack, and can move through buildings to reach his target. Bring the gods back to Olympus to reorganize the attack. You can even swap your gods for a different lineup! Summon Marathoners, very fast-moving melee troops with the health and strength of Hoplites. Careful, they can be charmed! Regularly spawns Marathoners to defend your city. Boosts the speed of all units. Maximum speed boost is 25% at level 40 (without Environment boost). Boosts the speed of units in adjacent buildings. Maximum speed boost is 15% per house at level 25 (without Environment boost). Coast theme, with 100% boost to Hermes Temple bonus and 20% boost to Hermes House bonus. Don’t miss your chance to try out Hermes in the upcoming Challenge Event! Check out Hermes’ powers in action here!